The main activity of Juranko S.M. d.o.o. 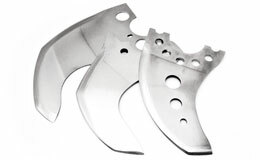 is manufactoring cutting tools and blades with reference to industrial knives and industrial blades and accessory parts for all industries whose production includes a specific type of cutting. Juranko S.M. d.o.o. have purchased new production equipment for 2015. Non-refundable funds for the implementation of this project were awarded by the government of the Republic of Croatia and HAMAG-BICRO agency. wood industry It is important to note that these tools are mostly made of highly alloyed steel, whose characteristics are great resistance and endurance, which allows the blades to be exposed to hard dinamic load. food industry Considering the specific demands in the food industry, the blades are made exclusively from stainless steel, therefore alloyed steel which have excellent characteristics and meet all requirements in this industry. Industrial knives in cardboard processing Industrial knives in cardboard processing are used for various process of cutting, cut-off, and folding and they are made of highest quality tool steel. If you are using knives or blades in your production and you didn’t found them on our website please contact us and show us your drawing or sample, as it is impossible to show all our machine knives on the web. We only need sketch or a sample and with our pleasure as soon as possible we will send you an offer with best prices. All JSM machine knives are manufactured in our production of raw materials to heat treatment and grinding, there is no outsourcing. 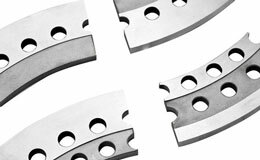 Our capabilities in producing knives or machine parts are to 1500mm for straight knives and round knives or parts to ø400mm. As a service we have grinding machines that can grind and hone knives or machining parts up to 4000mm. 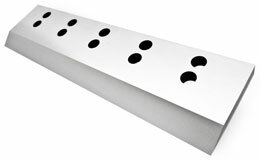 For the production of machine knives use only the highest quality tool steels, high speed steel and powder steels.